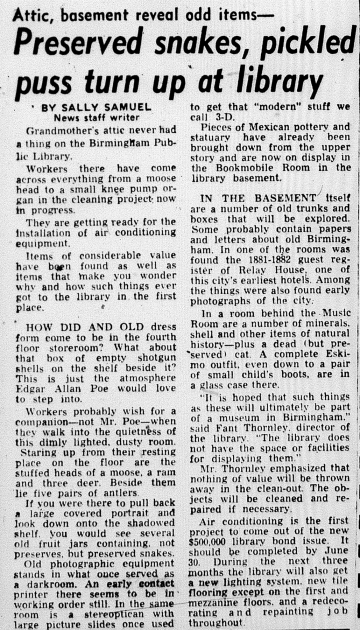 The Linn-Henley Research Library is the current name for the 1927 building in Linn Park which was the primary location of the Birmingham Public Library from its completion until 1984, when a new Birmingham Central Library was built across 21st Street North. After the former library rooms were burned in the 1925 City Hall fire, books and building funds were donated from all over the country. The neoclassical style Indiana limestone-clad building opened on Woodrow Wilson Park on April 11, 1927. It was designed by Miller & Martin Architects. The main entrance on the Park Place led into the large "circulation room", decorated with a series of large murals painted by Ezra Winter. To the east was the innovative "popular literature" department, staffed with "readers assistants" to recommend books to patrons. On the west was the children's department, with a separate entrance from Capitol Park and its own mural series depicting scenes from fairy tales. The mezzanine level contained offices for the library and for the Jefferson County Library Department, with displays of art and artifacts in glass cases in the corridors. The second floor housed reference works, as well as art, science and technology departments. The third floor held periodicals, medical references, a gallery of artwork, and the Southern History collection endowed by the heirs of Edward Tutwiler. Additional executive and staff offices also occupied part of the third floor, with book repair sharing the fourth floor with a suite of five auditoria ranging in capacity from 80 to 120 people. The central library was upgraded with air conditioning, new lighting and tile flooring with $200,000 in bond funds in 1954. During that project a number of curious items were found stored in the library, including a knee-pump organ; a dress form; a box of shotgun shells; jars of preserved snakes; mounted moose, ram and deer heads; Mexican statuary; and a full suit of Eskimo clothing. Director Fant Thornley said at the time that all the items with any value would be preserved, but that the library itself had no space for displaying them to the public. After the construction of the nearby Birmingham Central Library in 1984, the 1927 building was renovated and reopened as the Linn-Henley Research Library. It was named for the families of Charles Linn and John C. Henley, whose combined trust helped fund the restoration. The main reading rooms were devoted to the Tutwiler Collection of Southern History and Literature. Other departments, such as Administration, Archives and Manuscripts, the Rucker Agee Map Collection, and Government Documents are housed on other floors. The third-floor auditorium is used for public events, and an enclosed pedestrian bridge connects the library to the third floor of the new central library. The murals were cleaned and restored in 1989. The ceiling decorations were reproduced in wallpaper following extensive plaster repairs during the 1980s renovation. This page was last modified on 25 January 2019, at 15:36.